I wanted to see this place. You may have felt the same way too. But since returning from my recent trip there I want to introduce you a different Greece. One beyond the intense beauty of the landscape. One beyond the world famous sunsets. It is the Greece I want you to taste. 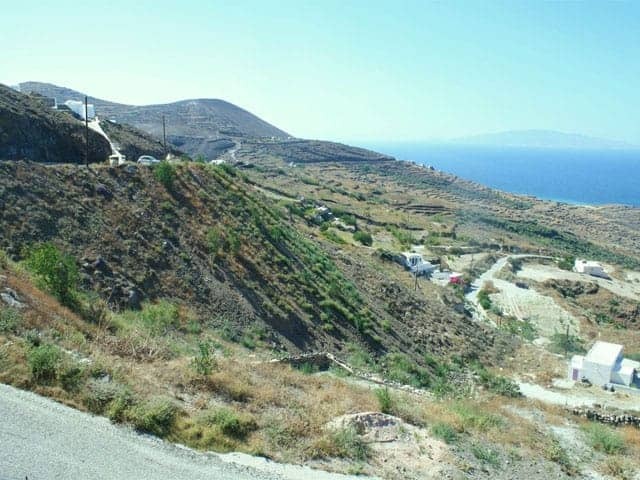 But to understand Santorini, and especially its wines, you need to first understand its history. Now I’m going to put myself out there right now and confess that I’ve never been much of a history buff – ever – unlike my husband who loves all things history. But learning about the history Santorini was more fascinating to me than my very first time touring a winery. This is because Santorini is like no other island in Greece. In fact, it is like no other location on the planet. Santorini is an island located approximately 200 km (120 miles) southeast from mainland Greece in the southern Aegean Sea. Its uniqueness, both physically, and as a wine growing region, is due to its rich geological history. Though there is evidence of vines being cultivated some 5,000 years ago, it was the event that happened 3,600 years ago that influenced the Santorini as we know it. 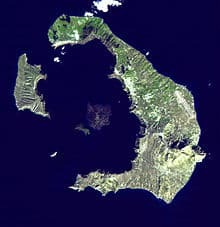 The island’s most important geological event, which occurred around 1600 BC, was one of the largest volcanic eruptions ever in recorded history. This massive eruption blew apart the western portion of the island, with the center of the island collapsing thousands of feet into the sea, forming a caldera surrounded by volcanic ash deposits. The result is something that looks like a half moon shape, with a group of smaller islands surrounding it. This is the primary reason for not only the breathtaking beauty of the island, but also the resulting soil that influences the intense wines of the island. I was told that locals began returning to the island some 300-400 years following the volcanic eruption. People eventually started cultivating the land again, but now on an entirely new soil – volcanic ash, lava, and pumice stone – which are important factors in creating wines high in acid and rich in minerality (two primary characteristics of the wines of Santorini). I visited the island in early July. A time of year when the air is very dry, temperatures are hot, the sun is intense, and the winds are strong. The combination of these factors is not ideal for wine grapes, as such intense sun exposure can burn the grapes and intensify the sugars (far more intense than winemakers generally want). But because of these very factors local farmers began to cultivate the vines in a way I have never seen before. They created a unique pruning system in order to successfully grow grapes in even the harshest of conditions. By far one of the most unique features of the vineyards of Santorini is the system of vine growing and management – probably making them the most unique vineyards on the entire planet. The vines are not trellised (like traditional vineyards you may be used to), but instead are grown low to the ground, and formed into the shape of a basket, or “ampelies”. And instead of trimming off old vine shoots year after year, they are woven into this basket, or wreath looking shape. The grapes then grow on the inside of these “ampelies” in order to protect the grapes from the harsh winds and intense sun. You can tell how old the vines are by how many rings surround it. After 75 years the baskets get so big and thick that many farmers will cut them to the root, starting fresh (but the actual root remains the same). On an island as dry as Santorini in the summertime it is also important to note that you will find no irrigation here – therefore the grapes must learn to live without water. It helps that the sea fog surrounds the island at night, seeping into the soil, allowing the vines to receive some needed natural moisture from the sea. That salty air also influences the briny characteristic of many of the wines of Santorini. There have been experiments with traditional trellis systems in the past, but the winds completely uprooted the vines and destroyed the vineyards. There is even a story of one vineyard owner who found his vines a few hundred feet away from where they were planted after a strong wind storm. The few trellised vineyards you do see on the island, like at Domaine Sigalas for example, are there for experimentation. It will be exciting to see what becomes of them. 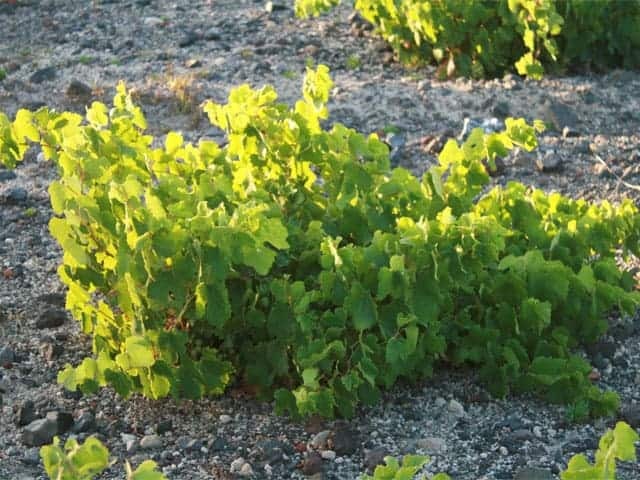 The grapes of Santorini, which will be explained in later posts, are all indigenous to the island. Phylloxera has never inhabited the island, therefore the vines are all on original rootstock. In fact, in Santorini phylloxera cannot exist at all. 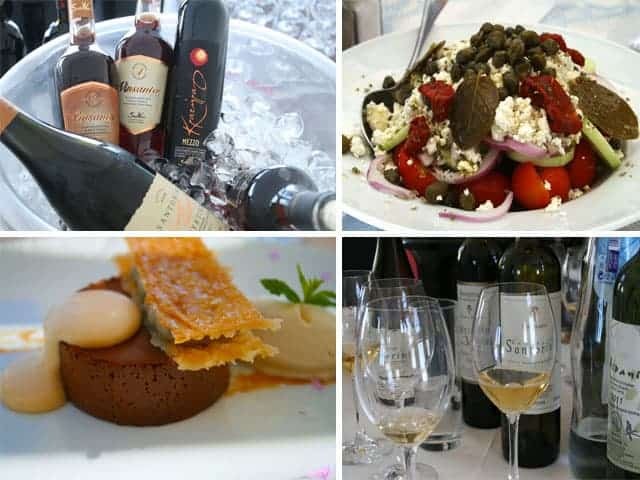 According to George Athanas from All About Greek Wines, and Wines From Santorini, phylloxera needs at least 5% clay soil to spread (I never knew this!). 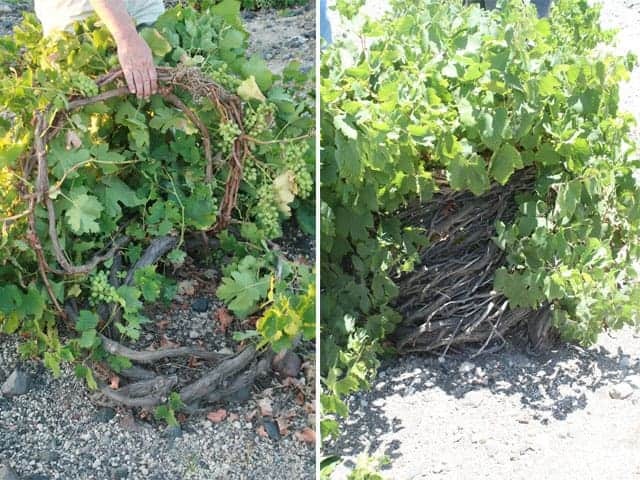 There is no clay soil to be found in Santorini, making the vines immune to phylloxera. In more recent history, the island was struck by a devastating earthquake in 1956, forcing many to abandon existing vineyards and leave the island. You will see an estimated 1400 hectars of vineyards currently under cultivation (half of what existed prior to the earthquake). Looking at the landscape of the hillsides of Santorini you can see acres and acres of the remains of where the vines used to thrive. Perhaps someday soon, those former vineyards will thrive once again. That, of course, will be up to those who taste, discover, and buy the wines, and then buy again, so that the demand for more continues. 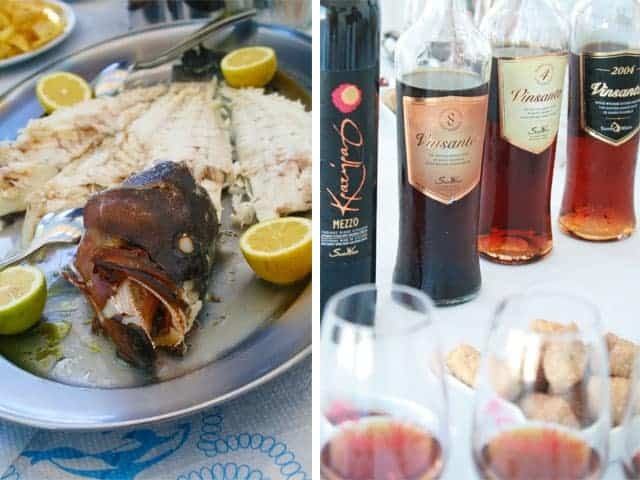 It is these factors, and more, that all lead to the uniqueness of this island, as both a tourist destination and as a wine growing region. Throughout the next few weeks I hope to introduce you to these amazing wines, the stories of the people behind the wines, the food, the culture, the tomatoes — oh god the tomatoes! — so that perhaps your idea of Greece can expand beyond the generic (but oh so beautiful) image of the white buildings with blue tops. I hope you will join me on this journey of Santorini. A place worth learning about with wines truly worth tasting. Fascinating – really looking forward to part 2!! My wife and I honeymooned on Santorini and fell in love with the place. We visited several wineries and even brought some of the wine back. Thanks for the wonderful write-up!